A street styler works a tropical print – get the look with our tropical print ruffle skirt, £49. Hands up if you’re humming Club Tropicana right now? Or suddenly in the mood for a can of Lilt – remember them? It happens to us every time we hear the words tropical print. Actually, we’d kill for a Lilt right now. But, we digress. Myleene Klass nails the tropical trend in a bold maxi dress. Our printed maxi, £59, will work at home and on holiday. Tropical prints are to summer wardrobes what BBQ’s and chilled rose are to sunny days – integral. When you wear a tropical print it doesn’t matter if you’re more likely to be catching some sunshine in Blackpool than Bora Bora– you’ll instantly feel more exotic by association. Who needs air miles when tropical patterned tops, skirts, trousers, and dresses have the ability to transport you to far-flung destinations? Throw some exotic animals into the mix like street style star Helena Bordon with our tiger print blouse, £49. If you’re currently having flashbacks to your dad rocking a Hawaiian print shirt on holiday, fear not – today’s tropical prints pack the same punch, but in a much more modern way. As always, the street stylers are providing us with endless tropical outfit inspiration. Think cool tie-neck blouses, not tropical shirts, maxi and shirt dresses splashed with hibiscus florals and palm prints. Exotic flora and fauna, technicolour brights and tigers. Even when it’s peeing it down, it’s hard not to feel positively exotic in these pieces. 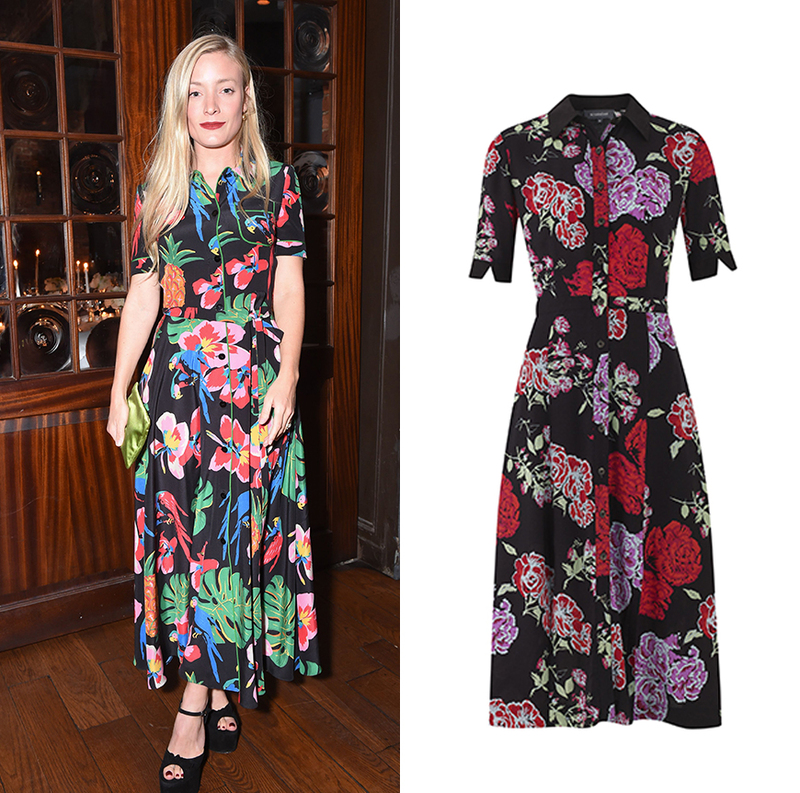 Fashion Stylist Kate Foley works the trend with a chic shirtdress – steal her look with our bold bloom design, £79. That said, beware of getting too carried away with the whole Club Tropicana vibe in England – you don’t want to look like you got lost on your way to a carnival. Temper loud prints with denim – classic blue or white will work – or black separates. A leather or denim jacket is the perfect foil to a bold dress. When you’re in an actual exotic location, however, forget everything we just said – it’s carte blanche to go totally tropical, so clash patterns and pile on the brights. Heck, you can even wear an orchid in your hair if you really want to. 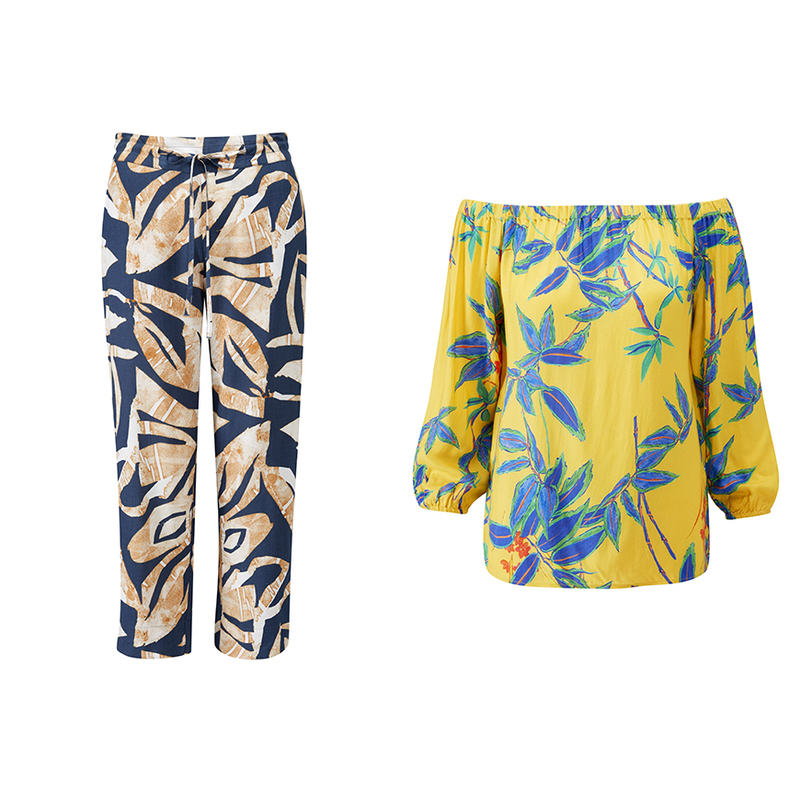 Abstract Palm Print Trousers, £45, Tropical Print Bardot Top, £39.